Year round: 9:00 - 11:30 a.m. hotel pickup from Anaheim Disneyland hotels, Marina Del Rey hotels, Venice hotels, Santa Monica hotels, Culver City hotels, Hollywood hotels, Beverly Hills hotels. Group discount available. At least three day reservation required! American Riviera Tours is excited to offer a completely new factory Citadel Outlet tours from Anaheim for Los Angeles tourists. This is a must do for serious shoppers in LA. Citadel Outlets are located in a 40 minutes drive from Anaheim or LAX ,just south of Downtown Los Angeles. Here you will find an exciting collection of 100 outlet factory stores from the world's leading designers and brand names, offering savings of 25% to 75% every day. Citadel outlets tour includes visit to Coach factory store, Adidas, Kate Spade, Ralph Lauren, Nike, Aeropostale, DKNY, Guess, Gap, Calvin Klein and more. We will help you out to find a right store for you and also advise on the latest trends in the world of fashion. Citadel outlets shopping tours is a quick and fun way to get the latest designer clothing and accessories. After the tour we will drop you off at the LAX terminal or Anaheim hotel. Also we can combine more sightseeing places in Los Angeles with Citadel outlets shopping tours: visit Hollywood Walk of Fame, TCL Chinese Theater, Universal Studios Hollywood, Beverly Hills Rodeo Drive, Melrose Ave shopping district, Santa Monica Pier and Third Street Shopping Promenade. If you have any questions, just drop us a quick note to info@latraveltours.com or call 1-800-761-1775, in Australia (03) 9005-5907. American Riviera Tours reviews. 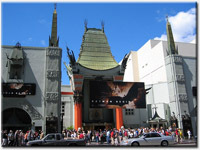 We will be glad to help you with your LA day tour planning, when you travel to LA.